So far we have written about a great deal of the FIFA World Cups, many of which we have not actually been able to have seen live. The first major tournament in my lifetime was in 1994, when the World Cup came to the United States of America. Although not being able to remember any of it (being only one year old), it is a competition which has been ingrained in popular culture ever since it started on the 17 June that year. Despite only catering for 24 teams, as opposed to the 32 we see today, the tournament remains the most attended of all-time. For a country which has become almost infamous with naming the game 'soccer' and showing a great deal more attention to other 'American sports', this stat is staggering. How did football take over the US in 1994? And what legacy did it leave? After beating Morocco and 2014 hosts Brazil to the staging of the competition the US prepared to host the greatest sporting spectacle of all-time. Like Brazil this year, the nation was to host the Olympic games two years later (in Atlanta). The World Cup could provide the United States with an opportunity to showcase what their nation had to offer, especially in the wake of the Cold War, only ended four years previous. The 1994 tournament was in fact to see the first competition in which the newly federalized Russia compete and the gift of three points for a win. This was due to the negativity of play in Italia '90 which led to a, v profligacy from those competing. How did the USA react? Attendance figures alone would suggest positively. A total of 3,587,538 people attended the competition averaging at almost 69,000 a game. Due to the American's past with 'soccer' many observers from around the footballing globe believed any idea of a World Cup in North America absurd and based on FIFA's greed rather than spreading the influence of the beautiful game to all corners of the game. Indeed the US offered a chance to boost advertising even further, but the major tournaments which have succeeded 1994 have been held on four different continents promoting the idea that football was now the World's game. The tournament is of certain interest to the UK too as England like in 1974 & 1978 did not qualify for the finals, neither did Scotland, Wales or Northern Ireland. This left many British fans supporting the Republic of Ireland who had qualified for a second successive World Cup. Despite this, 1994 saw heightened sectarian tensions with the loyalist North. Ray Houghton's opening goal against Italy however, brought some scenes of immense jubilation across many areas of the UK. The large Irish communities within Great Britain meant some football fever was found. Elaine Aston has referenced Marie Jones' A Night in November, where a Northern Irish man finds himself cheering for the Republic as a way in which football could unite different areas of the globe. For many people when asked about the 1994 World Cup, they immediately think about the opening ceremony in Chicago. The ceremony was to prove a symbol for the tournament which was to follow it, an awesome spectacle with delirious fans, but also one which started with a horrendous penalty kick. Who was it by? Diana Ross. The American 'Motown' legend was supposed to score a 5-yard penalty into a collapsing goal during her performance. Famously she managed to toe-poke it wide, leaving the goal falling apart for no apparent reason. Ross for once did not reign 'supreme' but the wider spectacle whetted a nation's appetite for the festival of football which was to come. The group stages saw the hosts US pitted against Colombia, Roy Hodgson's Switzerland and Romania boasting the likes of the influential Gheorghe Hagi. The US managed to qualify in third place as a best ranked third placed side, ahead of the old enemy Russia and South Korea. The first round also saw a unified Germany drawn with Spain as well an intriguing group E, in which Italy, Ireland, Norway and Mexico all finishing on four points with goal differences on +0. Norway were the unlucky side missing out due to only scoring one goal. It was the USA's group which was to be the most controversial, with the final game between the hosts and Colombia. In one of the sport's saddest and most tragic episodes, an own goal by the South American's defender Andres Escobar resulted in an angered nation and the player's murder at a diner by apparent drug cartels. Football, which had been in someways united from sectarian issues was now the source of death. A global sport taken too seriously. Further afield saw the end of Diego Maradona's career. 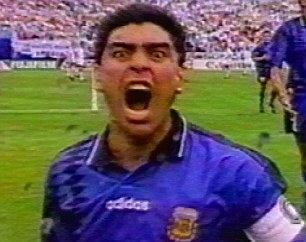 Following a wonderful team goal vs Greece, something about Maradona's tenacious and wild celebration which saw him run towards a television camera didn't seem right. El Diez failed his subsequent drug test and was sent home early from the tournament, leaving stars like Gabriel Batistuta to take over the reigns for la albiceleste. "With Argentina playing like one of the 1994 World Cup's stronger teams and Diego Maradona playing like his old superstar self, the team and the soccer world were shocked today to learn that Maradona had tested positive for a banned drug, ephedrine." The knockout rounds saw the end of the Republic of Ireland's journey as the Netherlands defeated them 2-0 in Orlando. Perhaps Ireland's most memorable moment was against Mexico when John Aldridge and Jack Charlton both lost their 'cool' in the searing American heat. The former Liverpool striker's range of expletives made for great comedy but also some surprise. BBC Sport's Chris Bevan wrote that, "If this was your first World Cup then you probably learnt some new words that day." Elsewhere a Gheorghe Hagi inspired Romania defeated Argentina and an extra-time winner from Italian maestro Roberto Baggio saw the Azzurri progress to the quarter-finals. Il Divino Codino had started the tournament slowly but the knockout stages saw the 1993 World Players of the Year flourish and begin to make Italians believe a fourth World Cup was on its way. Of course the 1994 World Cup will be remembered for winners Brazil. Following their last 16 victory over the US - a game which is now more remembered for an elbow from Leonardo on the US midfielder Tab Ramos. Ramos who had just signed for Real Betis suffered a broken jaw and skull fracture putting him out of the whole 1994-5 La Liga season! Despite this violence, the quarter-final clash between Brazil and Holland was one remembered for its beautiful football, wonderful goals and the celebration from Selecao forward Bebeto. Following the birth of his son Mattheus, he famously 'rocked the baby' with fellow star Romario. It was Romario who stole the show for Brazil scoring five goals and winning the 'Golden Ball' which was awarded to the tournament's best player. Before the final at the Rose Bowl Stadium in Pasadena, California the competition still had a fair few shocks to throw into the mix. The 1994 World Cup had been a success, amassing incredible support as sides like Spain, Argentina and Mexico all faltered. This was much to the favour of nations such as Euro '92 hosts Sweden and Eastern European minnows Bulgaria. It was the skills of Tomas Brolin and Hristo Stoichkov which proved too much for their opponents. Sweden defeated fellow dark-horses Romania on penalties to reach the semi-finals, before Bulgaria stunned defending champions Germany and indeed the world as Yordan Letchkov's diving header ended any German progression. What Sweden and Bulgaria had achieved was staggering, but in the semi-finals they came up against the two greatest international sides in World football. Brazil defeated Sweden 1-0 and a Baggio brace saw off the Bulgarians in New Jersey. The final promised much, the tournament as a whole had produced the spectacle needed after Italia '90, but the reality was a nervous, negative anti-climax. After 120 minutes the score remained goalless, with a staunch Italian defence keeping out Bebeto, Romario and co. Hardly surprising when you see who made up their centre-back pairing - Franco Baresi and Paolo Maldini. Under Arrigo Sacchi, the partnership had been the focal point in Milan's consecutive European Cup triumphs in the late 1980s. The final would be the first ever to be settled by penalty kicks. The shootout has now become infamous for one moment - Roberto Baggio's final effort from 12 yards. With the world at his feet, Baggio managed to sky the ball over the bar and with it Italian dreams. Brazil had won their fourth World Cup, one which reclaimed the glory from 24 years previous. It was a victory which Brazil undoubtedly needed after spending too long in the international doldrums, seeing superstars like Zico, Eder and Socrates all retire without winning the ultimate prize in football. Through Romario and the rest of the squad, Brazil could finally hold their heads high and provide a core which would go on to perform well in France and Japan/South Korea. "Franco Baresi skied over the bar and Taffarel denied Daniele Massaro - but his miss was the decisive one and sadly, in a glittering career, the moment for which he is most famous." The 1994 World Cup was one to remember, a tournament which rekindled the attacking nous of competitions which had gone before 1990. America had put on a show which expertly brought the fans to the forefront of the action. By the time France took over as hosts four years later the World Cup had expanded to include 32 teams due to the positivity of 1994 and growing sense that the competition was truly one which represented the whole world. Many critics have been quick to say that since 1998 and the inclusion of teams like Jamaica, Trinidad, Iran and North Korea have meant a lack of quality in some aspects. For them 1994 is often revered as the last tournament of a truly high standard, but I would disagree. From 1998 onwards we have seen Zidane, Ronaldo, Klose and arguably the greatest international side of all-time in Spain take centre stage. The US World Cup was undoubtedly one which inspired a nation who before hand had not taken the sport to its heart, but I would argue it also inspired football to become truly global and more representative of its supporters. Furthermore, since 1994 the World's greatest sporting spectacle has been held (including 2014) in four continents. Did the 1994 World Cup leave a legacy? Without doubt.